Watch movies, play games and complete your tasks using the ViewSonic 22" Class LED Monitor. This 22" Class LED Monitor features maximum resolution of 1920 x 1080 that produces content with peppy colors and exceptional picture quality. The 20000000:1 Dynamic ratio and 1000:1 Native ratio offers great color resolution with perfect contrast. In addition, 2ms (GTG) response time helps to deliver exceptional performance that is especially noticeable when playing games and watching videos. Included with VGA, DVI-D, DisplayPort and 2 Port USB Hub, you can now connect your monitor with other media sources and enjoy to the fullest. The built-in Speakers save more space and provide excellent audio output while watching movies, playing games etc. Using this monitor you can save power and reduce your current bill charges as it is an Energy Star product. 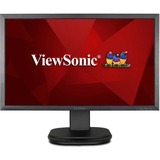 Purchase the ViewSonic 22" Class LED Monitor today!